What has been updated, Latest News, Events, Running Day 2019. 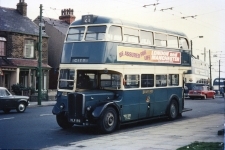 Our next event which we will be attending is the Teeside Vintage Bus Running Day which is based at Middlesborough's Transporter Bridge on April 28th, where we shall be taking our Bristol RELH which will be running on the FREE service, so why not come and say hello to us. A full list of events we hope to attend can be found on the Events 2019 page. 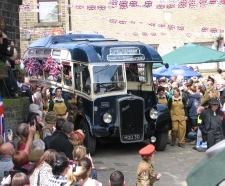 The group will once again ran the popular FREE vintage bus service from KWVR Haworth Station to the top of the Main Street (Bronte Parsonage Car Park) using four vintage double decker buses. Please call back for updates. 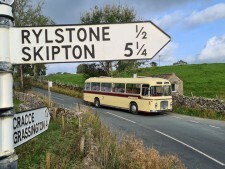 Once again the Yorkshire Dales Running Day returned on Sunday October 14th 2018 with vintage buses and coaches running a network of FREE services into the Yorkshire Dales. 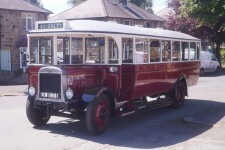 Services started from Skipton Bus Station between 1000 and 1700 with most services running with good loads.This year we celebrated 90 Years since West Yorkshire Road Car was formed. On Saturday 13th October we remembered Pennine Motor Services with ex Pennine buses running on thier former routes throughout the day. 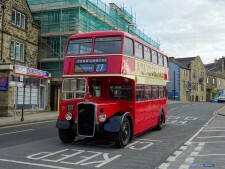 Services ran from Skipton Bus Station between 1000-1700 with most journeys full. Please keep calling back for details. The famous Nocturnal Heart of the Pennines rally which was to be held on Sunday 28th October 2018 has sadly been cancelled, due to not being able to secure a commitment from the new trust which is now running the referbished Piece Hall. We aiming to secure a commitment to hold this years event at the Piece Hall on October 27th 2019 but so far we have not had it confirmned as ok. Please keep calling back for further updates. It is always pleasing to receive a complement on either vehicle turnout or a job well done, but last weeks job perhaps brought the bus preservation movement into a better light than that normally presented at many rallies. 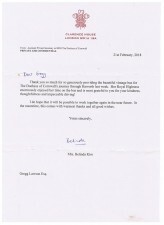 The ultimate accolade was to receive this letter from Clarence House thanking us for our efforts. 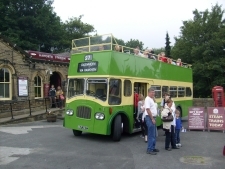 This helped to alleviate the disappointment of not being able to provide our Leyland Lion for the job due to mechanical problems which developed on the way to Haworth. A quick substitution of GWT 630 which was actually booked to do a wedding in Keighley saved the day, and EHL 355 was sent out on wedding duties until GWT 630 was relieved of its Royal duties. To see an expanded view of the letter then please click on the link below. On Sunday July 2nd we hosted a special event at KWVR Ingrow Railway Station to celebrate the 90th Birthday of newly restored ex Blythe and Berwick, Leyland Lion. KW1961 There was a small display of prime half cab ex West Yorkshire buses, with the KWVR running a vintage train compiled mainly of ex Lancashire and Yorkshire Railway rolling stock. 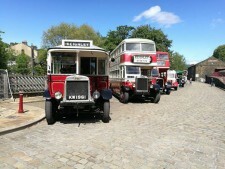 The day was blessed with hot sunshine all day which saw a large numbers of visitors to view this historc day. Work has finished, her first outing was to Ingrow Railway Station on July 2nd 2017 where a small display of prime buses celerbrated her 90th birthday. 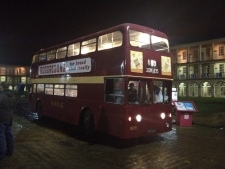 Following the unexpected death of member Keith Leighton who owned Ex Bradford AEC Regent III HLW159 this has now been sold to group members Alex & Greg Lawson and David Hudson, for continuing preservation in Bradford City Transport livery.